Help 10' jon boat motor ????? Don't know why not. 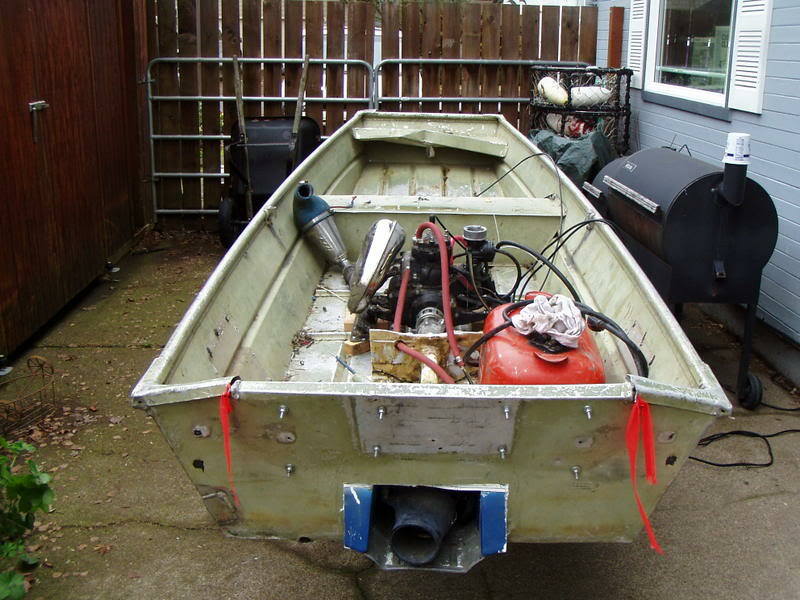 The first boat I actually owned was a 12' Sears aluminum skiff. I powered it with a 1978 Evinrude 6hp and had no problems at all. I have no idea what power the skiff was rated for. Should not be a problem as long as the weight/balance is ok by you. Many people I kknow put larger engines on that the boat is rated for. Your motor is 45lbs. A new 4 stroke 2.5hp Mercury is 40lbs. It won't hurt the boat one bit. With that said, you could potentially run into issues with control of the boat at wide open throttle. Be aware of the power your outboard will deliver. 6HP 2 stroke should do fine. Probably will plane it. You might need a tiller extension though to allow you to sit furthur forward for balance. How wide (@bottom not at @gunnels) is your Jon? Some really narrow, might be a tad unstable. Sounds like a small stream catfish boat extraordinaire. If the boat is rated to a specific hp...your state may have laws against exceeding that rated hp. You may want t check because if ever stopped...some states have no sense of humor. At the top it's 48" bottom is little bit narrower, I always have a passenger in the front anyway. Most 10 footers are rated for 5hp or 50lbs.I have an old Gamefisher jon boat that is rated for 5HP/50lbs.It's tiny compared to newer, post 70's, jon boats.I ran a 1980 5hp Gamefisher until they banned two strokes in my area.Now I run a Minnkota trolling motor. Mine measures 9.9ft x 27in at the widest section across the bottom. In addition to a possible ticket as mentioned by Mr. psneeld, your insurance may be void if you put more engine on than the manufacturer recommends. Could be financially devastating in an accident situation. A jet ski motor mounted in a jon boat. As noted elsewhere: Use at your own risk. After you install trim tabs, let me know how it rides. Assuming it's aluminum. I wouldn't worry about it. If it were to fail, the failure won't be a sudden thing. I would expect it to be in the form of rivits working loose, or fatigue cracks in the aluminum. These things will take a lot of use to manifest themselves. I would expect cracks to form in the upper corners between the transon and the sides. Fatigue accumulates over many, perhaps hundreds of hours. It is afterall only a six horse. Personally I would run it, use common sense, and watch for flexing of metal. Keep an eye on it, if after several years, it starts to show cracks, you can decide if its cheaper to get it TIG welded or throw it away and get a different boat. IF, it made of wood, disregrard all of the above. That's just my opinion, it's your decision. You bring the worms? No way I could believe an old Evinrue 6 would tear the transom off. In my mind, (a very confused place), I see any boat that has been altered, as not having a specific horsepower rating. If it has been altered for your personal use based on your engineering, I don't see how the original Coast Guard hp rating could come into play as far as making your boat legal or not. I say do what you think is right, and test it a bit, then test it hard, and determine for yourself whether you have done the right thing. Ok well I don't even have the tag on my boat for the cops to see its rated for a 3hp as what the average 10' Jon boat is rated for, from what I read on the Internet. It's a apache 10' Jon boat like I said no tag. The rating is based more about loading, level flotation and handling. So beefing up the transom to hold a higher hp engine isn't the issue, it's about having the boat filled almost to the gunnels and doing a high speed turn and dumping everyone in the water. I wouldn't think it possible to flip a 34 Silverton based on the number of people on board..but somebody figured out how to do it and killed people. Now there's an outcry to put those same capacity plates on even bigger boats. If you alter your boat significantlty...I think you can apply to have that plate changed or if it really is changed that much...I would say rip it off ad call the boat a homebuilt...but to stay within the law ya gotta do something. Where the OP is, I'm not sure the USCG even has juridiction (waters wholly within a state) and as I said in my first post...the state may or MAY NOT have a rule against it...I know New Jersey does so I passed the info along. As for being sued...you have someone hurt or killed on a boat of yours these days...doesn't matter if you are squeaky clean..your legal bill alone might bankrupt you and even if you counter sue for legal bills.. you might get excactly what they have...nothing. The boat is designed for 3HP and you wand to double it to 6HP. Put exactly twice the power on the boat. You always have a passenger on the bow and the cops don't patrol the area where you will be using the boat. You don't know if it's OK to do this but "I'm kinda reinforcing it a little ". I think you've already made up your mind, you're just asking for permission. I, myself wouldn't do what you are planning on, but you don't need my permission. You already know this, but it's up to you. You (and your passenger) are the ones who will pay the price if things go wrong.